Through two early strokes, paralysis, a great college course and a near-death experience, this 2004 graduate found her purpose in life. For as long as she can remember, Michelle (Taylor ’04) Wulfestieg has felt the tug of a higher calling. She felt it at age 11, as she summoned the strength to survive a massive stroke triggered by an inoperable brain lesion. Doctors assaulted the tangle of arteries and blood vessels with intense bouts of radiation, a plan of attack that ultimately paralyzed the right side of her body. She felt it in the years that followed, when radiation was no longer an option and doctors told her she might not see her 30th birthday. She began to live with determined purpose. Despite being confined to a wheelchair, she became junior high school valedictorian. She learned to walk by high school, first with a leg brace and then with a significant limp, and she made her volleyball team all four years despite the use of only one arm. She was crowned high school homecoming queen, and in college traveled the world to climb the Great Wall of China and marvel at the majesty of the Taj Mahal. But it wasn’t until her senior year at Cal Lutheran, while taking a class on death and dying taught by sociologist Charles F. Hall, that Wulfestieg’s life purpose crystallized. As part of the course, students were assigned to work one-on-one with elderly nursing home patients to gain insight into their views on mortality, and Wulfestieg was partnered with a woman who, like her, had suffered a stroke and paralysis. She spent hours reading to the woman. Her patient came to cherish that time so much that, even with stroke-impaired vision, she bought a clock for her room to count down the minutes to Wulfestieg’s next visit. When the woman passed away, the family asked Wulfestieg to deliver the eulogy at the memorial service. “It’s a class that changed the entire trajectory of my life,” said Wulfestieg, who decided then and there to devote herself to a life of service. She launched a career in hospice work, drawing on the power of her own suffering to help terminally ill patients and their families find their own paths to healing and acceptance. 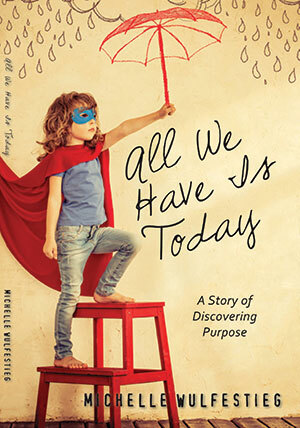 Wulfestieg, who lives in Newport Beach and serves as executive director of the Southern California Hospice Foundation, chronicles her struggles and triumphs in her newly released, award-winning memoir, All We Have Is Today: A Story of Discovering Purpose. The book, which has earned two gold medals from independent publishers and reviewers, provides an unflinching look at a childhood smashed to pieces by the diagnosis of a rare vascular brain lesion known as arteriovenous malformation. In the memoir, Wulfestieg speaks of her battle to heal and regain a sense of normalcy. She writes of the countless hours of physical therapy, of the paralysis that gradually set in after her first bout of radiation, of learning to tie her shoes and smack a volleyball with her one good hand. She recounts the relentless teasing by her peers because she was in a wheelchair and wore a leg brace, and because the steroids she took left her face swollen and her hair falling out in chunks. She writes of questioning her faith in God and of wondering whether she would be better off dead. But she also speaks of the strength she gained in learning to overcome and adapt, and how each setback filled her with fierce determination. She talks about meeting her husband, Steven Wulfestieg ’04, in the same death and dying class that set her on her path to hospice work, and how she eventually earned her master’s degree in organizational leadership from Chapman University. And she writes about how on the night she finished her master’s thesis, a rainy January night in 2008, her life once again was upended when she suffered a second stroke, this one far more devastating than the first as it plunged her deep into a coma and nearly took her life. With little hope for her survival, doctors said they had no choice but to surgically remove the lesion that was rooted inside her brain. Her family was told that she might never wake up and, if she did, that she would not be able to walk, talk or see. For eight days her family waited. Wulfestieg’s best friend wrote her eulogy, as doctors readied to remove her from life support, a move opposed by her husband, who never lost faith that she would recover. With her brain now free of the lesion that had plagued her, and with the same determination that has steered her life since age 11, Wulfestieg set out on a road to recovery, learning once again to walk, talk, dress herself and use the computer. Seven months after her stroke, she was back on the job, doing the work she believes God meant her to do. 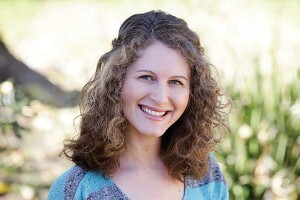 “Because I spent so much time in a hospital bed, on the brink of death, I am able to relate to what our patients are going through and connect with families in a deep, meaningful way,” said Wulfestieg, whose work with the Southern California Hospice Foundation focuses on improving quality of life for terminally ill individuals by providing services not typically covered by medical insurance. Sometimes that comfort comes from something as simple as preparing a meal or providing a ride to a doctor’s appointment. One of the best parts of the job is the foundation’s focus on granting final wishes, whether it’s taking a trip to Disneyland or meeting the star of a television show. The Christmas before last, Wulfestieg helped fulfill the wish of 5-year-old Ethan Collins, a Riverside boy who was diagnosed with a rare pediatric brain cancer in 2013. Ethan loved the story of Dr. Seuss’ How the Grinch Stole Christmas, and when Wulfestieg learned this she arranged for Ethan to meet the real-life Grinch, who made a special visit from Universal Studios to Ethan’s home. Several months after the Grinch made his appearance, in the months before Ethan passed away last August, Ethan’s family members were invited to the foundation’s annual golf tournament fundraiser to deliver the keynote speech about the importance of hospice. The foundation also presented Ethan with its annual Bravery Award, a medal that his grandmother said Ethan grew to cherish in his final months. Wulfestieg is not showing any signs of slowing down now. In the past couple of years, she worked with Showtime to produce a documentary series about end of life called Time of Death, which offered an intimate look at hospice patients’ final days and how they and their families cope. Starting in 2010, she began work on her memoir, typing with one hand. The book was published last year and has earned gold medals from the Feathered Quill Book Review and in the Illumination Book Awards, which are designed to honor and bring increased recognition to the year’s best new titles written and published with a Christian worldview. The memoir has become a favorite in classrooms and with book clubs, and has kept Wulfestieg busy with speaking engagements, book signings and other personal appearances. Most recently, she teamed with Kathi Koll, the widow of Orange County real estate developer Don Koll, to launch a motivational speaking tour designed to inspire patients and caregivers to live life to the fullest after stroke. Koll cared for her husband for six years, until his death in 2011, after a stroke left him paralyzed from the neck down. Koll said Wulfestieg has plenty of inspiration to share. Living with purpose – that’s really what Wulfestieg is all about. Now 33 and having dodged a death sentence, she has no intention of leaving till tomorrow what can be done today. While her right arm and leg are still partially paralyzed, and fatigue sets in sooner than she would like, she and her husband are in the process of adopting a child, and already she is booked through next fall with speaking engagements. Fred Alvarez is a high school history and journalism teacher who lives in Ojai. For more than two decades, he was a staff writer for daily newspapers including the Los Angeles Times and the San Diego Union-Tribune.